Trying to eat cheese with apple pie cost me the tip of my finger. But I've told you that story before, so I won't make you listen to it again. I just wanted to stress the point that eating cheese with your apples is worth a little pain and suffering. It just so happens to be apple season. So, you may be able to guess what went through my mind when I opened up a box to find three glorious packages of Skellig, a sweet, yet still pleasantly tangy Cheddar from Kerrygold. Yes, apples and cheese were on the menu. I love making apple pies with Cheddar in the crust. But since that's something that we eat fairly often, I wanted to go a different route. Cobbler. 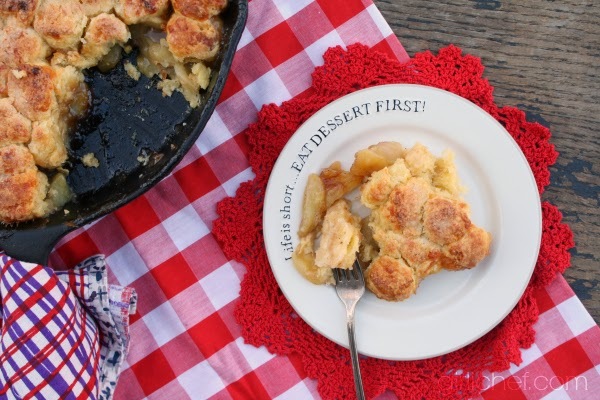 There's not much better on a chilly winter day than a warm, biscuit-topped cobbler fresh from the oven. The smell alone will warm you to the bone. 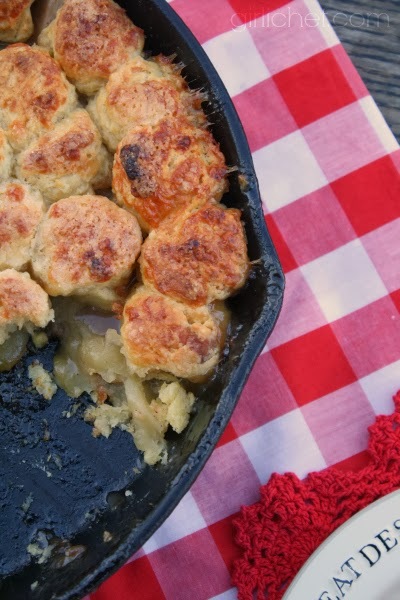 But add Skellig to those biscuits, and you've got a savory, cheese-infused crust sitting atop a bed of warm, tender apples and spice. One bite will warm your future children to the bone. Place flour, baking powder, and salt in a large bowl. Use your fingers (or a pastry blender) to cut the cold butter in until you have a coarse meal, with the butter being the size of baby peas. 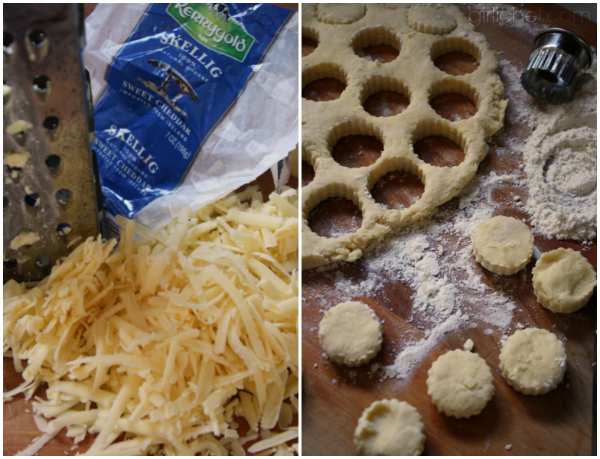 Toss in the cheese and gently toss everything to coat and separate the cheese shreds. Whisk the cream and egg together in a small dish, and then add it to the bowl, stirring to just combine. Dump the whole mass out onto a floured work surface, and quickly pat and knead into a disc that is about 1/2-inch thick. Don't work the dough too much, or it will become tough. At this point, you could use a floured biscuit cutter (small or large) to cut the dough into biscuit-form. Re-roll and cut until they dough has all been used. Or you could simply tear the dough into rough "rags". Set them aside for the moment. Now, peel and core the apples, and cut them into 8 wedges each. Add them to a large bowl that already has the lemon zest, juice, and Brandy (if using) in it, as you work; toss around after you've added more, to keep them from browning. Whisk the sugar, cornstarch, and spices together, then toss them with the apples. 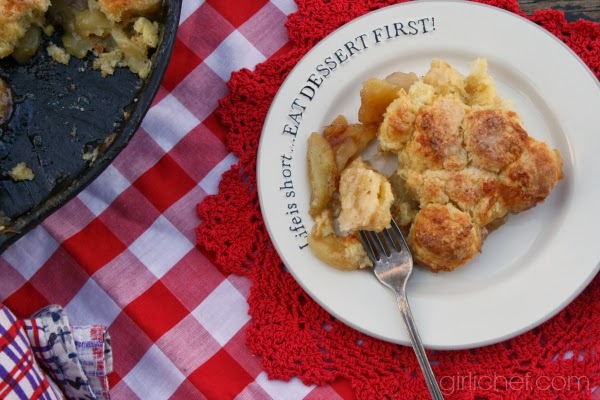 Set an 8" or 9" cast-iron skillet over medium heat with 1 tablespoon of butter, and dump in the apples, scraping all of the juices in, as well. 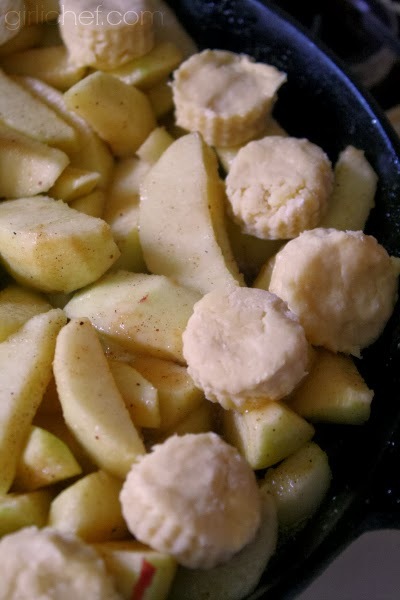 As it comes to a bubble, scatter the cut biscuits randomly over the top of the apples. Whisk the egg and a dribble of cream or water together; brush the tops of the biscuits with it, then sprinkle with the sugar. Once it is fully bubbling, slide the pan into the preheated oven and bake for ~25 minutes, or until the biscuits are golden and the juices are thickly bubbling up around them. Serve warm, with vanilla ice cream, if you wish. I am a member of the Kerrygold Food Bloggers Network. I received Kerrygold Skellig cheese and Kerygold butter at no charge. I was not compensated for this post. I am also entering this into the Skellig Recipe Contest. All opinions stated are my own.